The Internet of Things (IoT) is the most impactful mega trend today for products and services companies. Today we are at the cusp of large scale industrialization of Internet of Things initiatives that will achieve the business objectives. The information technology is revolutionizing products into intelligent, connected devices. The products solely composed of mechanical and electrical parts, today have transformed into complex systems with the combination of sensors, microprocessors, software and connectivity in myriad ways. These new connected products are reshaping the industry boundaries and ushering in a new era of competition. IoT and connected products will drive the next generation of technology and productivity growth for companies, their customers and the global economy. 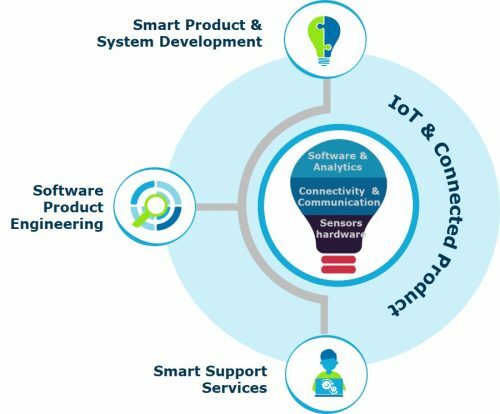 Every business will need to evaluate the product-as-a-service model to leverage the landscape of IoT and connected products. Our strong partnerships with leading IoT platform providers, end-to-end product engineering expertise, investments in technology assets, co-innovation and experience across domains come together to provide end-to-end services to build connected products, digital platforms and solutions enabling servitization.